One of my grudge against Epiphany is that its tabs goes off-screen when I open lots of tabs and I need to scroll through the tabs to find the tab I wish to switch to. This gets really annoying when I have like a dozen or more of opened tabs. Googling around, and I was pointed to this epiphany extension from Epiphany 3rd Party Extensions page : Only One Close Button. Looks like NTV7 just started showing one of my all time favourite anime! 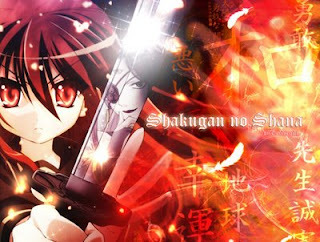 .. Shakugan No Shana!!!!. I noticed it just now, when they air the first episode. And guess what, it remains in Japanese, which ROCKS!! So, Saturdays: 12:30pm, Malaysian anime lovers get the chance to see Shana in action, on Malaysian TV!. I have the whole 2 seasons (season 2 just ended a few weeks ago) in my anime collection, but I guess I'll still watch the TV version (although, undoubtedly, it might have some parts cut). First Trinity Blood, then Jigoku Shoujo, and now , SHANA!!!!!!. And all of them broadcasted in the original Japanese language, which preserve the beauty of the original seiyuu, the sound effects, and most important, the moe-ness!!. This is almost a very old news I presume, nonetheless, I just noticed it today while wasting my time jumping to random Open Source project sites. It is well known that skype and pulseaudio doesn't play well together. Skype's ALSA implementation doesn't really implement all of the standard ALSA API which caused alsa-plugins-pulse to not work with skype. Fortunately, as stated in PulseAudio Perfect Setup page, the skype static OSS (Open Sound System - another sound standard, different than ALSA) package can be used to work around this issue through padsp. However, the skype_static-oss package come in a tarball, of which, is ugly/inconvenient to certain people (like me). So, I've hacked together a spec to repackage that binary blob and make Skype almost JustWorks for Fedora. I don't know what Skype's regulation for redistribution of their binaries, so, to be safe, I can only provide you the RPM spec file. Here is the spec file : skype_static-oss.spec. I noticed this just now when playing around with the panel on my dualscreen setup. If both screens have a panel with window list on it, the window list will only show the windows of the screen where it resides. First up in this post. Workspace v0.1. This was my workspace since I started my internship with Inigo. 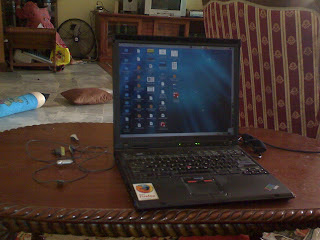 Small, compact, with only my 1024x768 resolution of my loyal companion Thinkpad R51. After 4 months with Inigo, 1024x768 started to feel too small to work with. So, on the last PIKOM PC Fair, I decided to grab one external monitor to plug to this laptop for extra screen real-estate. Kaeru recommended me to grab one very big screen - 22inch - and I went for it. Lucky for me, Dell was having a promotion for their E228WFP Entry Level monitor. For only 849 MYR (approx 265 USD), I'll get a 22inch TFT monitor with 5 years warranty. Tempted, I bought it. Its not cash-n-carry, so I had to wait a week for the monitor. Setting up for dual display is a little bit tricky with my laptop's i855gm. First, Xrandr couldnt detect all of the resolutions of my 22inch screen. After some tweaking with Xorg.conf and guessing config entries, I got it working at last. A Meme happening at Planet Fedora. I'm hopping in too~!. I use vim and python more than cd and ls ?? Thats unexpected.